Helen Robinson has put together a comprehensive history of Maynardville and its Open-Air Theatre to commemorate its 50th Anniversary. It includes a history of the property from the time of the Dutch East India Company and the British Colonial Government to the Maynard family who gave their name to this famous piece of land. 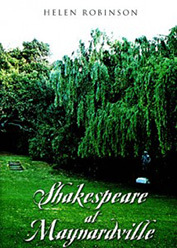 Brimful of pictures and anecdotes of Shakespeare’s plays across the years, this publication is a must-have for those who love theatre, Shakespeare and the history of Wynberg in the Cape. 128 A4 pages. Available in printed format only.